Are you pondering, what the heck the Oakland Raiders were waiting on during the free agent frenzy? Especially with many questions left on unanswered on their offense line with the exit of Robert Gallery. 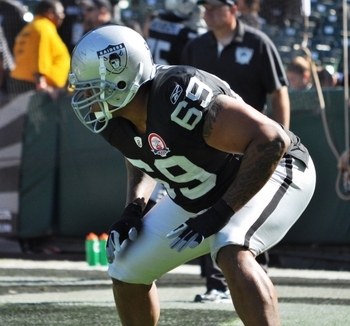 Saturday morning the Raiders may have filled the hole at offense tackle rather quickly by resigning offensive tackle Khalif Barnes. The Raiders were actively in pursuit of the former Baltimore Raven Jared Gathier services since free agency negotiations began earlier this week but he failed his physical and the Raiders decided to pass on his services. Having lost Gallery to Seattle earlier in the week, owner Al Davis now had to take a immediate stab at Barnes knowingly he can pick up for Gallery right were he left off. Last season the Raiders established a solid running offense as they ranked second in the NFL with 2,494 rushing yards. But the offensive line was torched against pass protection for quarterback Jason Campbell and others. The Raiders allowed 44 sacks last season the sixth most in the league. Not something to be proud about. Barnes is a decent offensive lineman, In his four seasons in the NFL he only has one complete season where he started all 16 games. If Barnes does in fact stay’s out of trouble and show signs of willingness to achieve, he has the ability in the prime of his career to become a successful offensive lineman in the NFL for the Raiders. This maybe not be exactly what the Raiders wanted but he understands the offense and will work great with the young offensive line.